The notion that Israel is the only true parliamentary democracy in the Middle East is supported by several fundamental markers: separate status and autonomy of the three powers: the executive, the legislative, and the judiciary; elections regularly held according to a pre-established calendar; a large number of political parties competing for office; and last but not least, periodic alternation of the main political parties at the helm of the government. The legislative in Israel comprises one chamber, the 120- member Knésset (Assembly in Hebrew) which by law is elected for a period of four years. Since independence in 1948, 20 Parliaments have been elected, the latest in 2015, but at least seven times the Knesset was dissolved before completing its full term with elections held one or two years in advance. Several important factors determine elections’ outcomes. The principal one is evidently the people's will to orient the government's policies in one or another direction regarding the many issues at stake. Israel faces many important issues that can be synthetised into three major threads: 1. Security and regional policies, including the Palestinian conflict; 2. The economy, welfare and social equity; 3. The incidence of religion in the state's civil life. On each of these, diametrically opposed opinions are reflected in extant political parties. The many possible combinations and permutations between these main issues, and attention to further ones, tend to generate substantial fractioning of the party system. Fractioning is enhanced by an Israeli electoral law that is quite unique from the international perspective: a pure proportional, with one national electoral district, voting for a list with no preference for candidates, and a moderate threshold of admission (a 3.25% of total valid votes). Each party presents a slate of candidates pre-ordered following internal primary elections or decisions by the respective secretariats, and those candidates placing higher enter the Knesset according to the votes obtained by each party. High democratic representativeness exists at the expense of governability, and indeed all Israeli governments have been based on majority coalitions of several parties. In recent years often the largest party did not even control one half of the seats within the coalition, making it sometimes vulnerable to ultimatum requests by smaller associates. Israeli society is a mosaic of different ethnoreligious groups. In 2018, within the current internationally recognised boundaries plus East Jerusalem and the Golan Heights, about 75% of the total population were Jews, 4% were non-Jews with family links to Jews (therefore de facto Jewish), mostly immigrated from the former Soviet Union (FSU), and 21% were Arabs, of which 17.5% Muslims, 2% Christians and 1.5% Druze. There also were other minuscule religious minorities. The 79% de facto Jewish majority reflected large-scale immigration from all continents. The balance stabilised at about one half originating from mainly Christian societies in Europe and America, and one half from Islamic societies in Asia and Africa. About 10% of Jews were identified with the Haredi sector (the Fearful in Hebrew, very religiously observant). Nearly two-thirds of the Jewish population and nearly all Arabs were actually born in Israel, but immigrant or native cultures persist in the longer run and reverberate on political identities. Unlike Italy with its clear north-south gradient, in Israel such differences are dispersed all over the national territory but are still quite concentrated at the local municipal or neighbourhood level. In such a context changes in the demographic composition of the electorate can to some extent affect the vote, and indeed such changes have been felt over time. As noted, the party typology in Israel is quite complicated, also reflecting repeated splits and mergers. The current Knesset has 11 parliamentary factions, and the government relies on six, some of them multi-party coalitions. But on closer inspection, it appears that the multitude of Israeli parties can be reduced to four main political camps. Each of these camps features significant socio-demographic and ideological common denominators, beyond inter-party differences. First, a political area supporting a negotiated political solution to the Palestinian conflict, a secular concept of society, and more egalitarian socioeconomic policies can be labelled as Israel's “Democratic” camp. Inside it the Labor Party in its different configurations long-held political hegemony before Israel's independence and during the state's first three decades until 1977. Today this camp includes centre-left parties like the Labor Party and Méretz (an acronym meaning Energy, a more radical faction) as well as parties of the political centre. The centre is a force that under different names and leaders periodically emerged between the right and the left, gained power, disappeared, and was born again. It currently comprises Yesh Atid (There is a Future), which replaced the Kadíma (Forward) Party founded by Ariel Sharon when he withdrew from Likúd. Since the early 2000s Labor was largely replaced by the centre as the leading component of the “Democratic” camp. Second, a camp sharing nationalistic, national-liberal and national-religious political ideas comprises the now largest Likúd (Unity) Party, Israel Beyténu (Israel our Home, catering to FSU voters), Habàyt Hayehudí (The Jewish Home, formerly the National Religious Party) which incorporates the Jewish activist-mystical right, and of late Kullànu (We All, a moderate splinter from Likúd). A strategic common denominator is a preference for Israel's territorial hegemony over the promotion of negotiations with the Palestinians. In spite of inner competition, all of these together can be construed and labelled as Israel's "Republican" camp. Third, the Haredi camp comprises the Shas Party representing Sephardi Jews, and Yadadút Hatoràh (Bible Judaism) representing Ashkenazi Jews. These share assertive demands for a stronger impact of traditional Judaism on civil law and have exclusively male candidates. Inner differences are masked by a strategy of unity and above all by the willingness to serve in any coalition (right or left) provided it supports the education and housing interests of their constituents. Finally, common ground prevails among parties mainly catering to Arab voters: the communist Hadàsh (an acronym meaning New in Hebrew), the Islamic United Arab List, and the pro-Palestinian (and often anti-Israeli) Bàlad (Homeland in Arab). In 2015, despite important internal conflicts, these parties formed one common list. None of these parties was ever a full partner in Israeli governments. Reduction into four camps does not do justice to the complexity of Israel’s public discourse. However, simplification helps to understand the nature of the Israeli political process and its past and possible future trends. 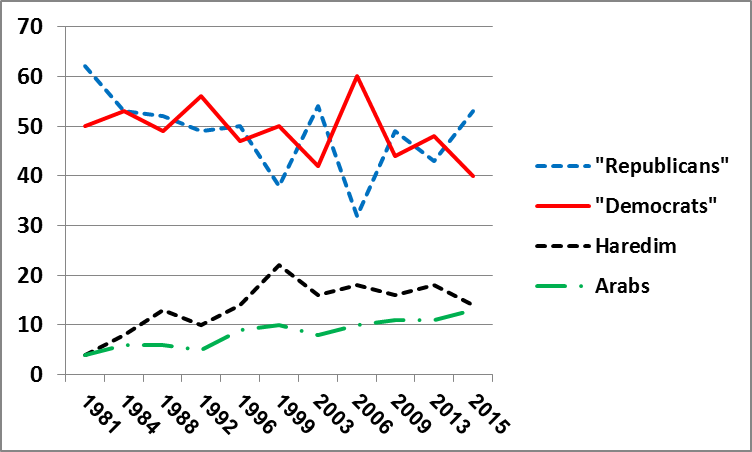 The chart shows the results of all Knesset elections from 1981 to 2015 through this parsimonious, four-camp format. In spite of repeated security and economic crises, huge numbers of new immigrants, and a massive improvement in income and standards of living, there was surprising stability in the balance of Israeli voting preferences. Periodic alternation of leadership roles between the two main political camps epitomized changing and critical perceptions by Israeli voters of individual and collective interests and needs. It may be surprising to note how balanced and cyclical in the long-run was the power alternation between the two main political camps – the Likúd-led “Republicans” and the “Democrats” led by historically declining Labor and rising centrists. Menahem Begin (“R”) won in 1981 – building on his dramatic 1977 turnaround of Labor's hegemony – followed by a virtual tie in 1984 between Yitzhak Shamir (“R”) and Shimon Peres (“D”). Shamir (“R”) prevailed again in 1988 followed by Yitzhak Rabin (Labor “D”) in 1992, Benjamin Netanyahu (“R”) in 1996, Ehud Barak (Labor “D”) in 1999, Ariel Sharon (elected as “R” in 2003 and eventually converted to centrist “D”), Ehud Olmert (centrist “D”) in 2006, and again Netanyahu (“R”) in 2009, 2013 (when the “Democrats” had a plurality of the seats but the centrists preferred to join a “Republican” coalition), and 2015. Both the Haredi and Arab camps clearly gained power over time thanks to their higher demographic momentum. Higher rates of growth played a significantly empowering role, but the parties' skill in bringing voters to polling stations on elections day was important too. Arab parties also enjoyed a growing reflux of Arab voters who previously had opted for Jewish parties. Unlike among Arab voters whose share of total Knesset seats constantly grew, the incidence of the Haredi camp was slowed down by incipient modernisation that drove voters away from very religious parties mostly to the nationalist “Republican” camp. Since the early 1990s the latter was also boosted by new immigrants from the FSU. The centre-left “Democratic” camp did not benefit from these demographic trends but, if anything, drew some votes from upwardly mobile “Republicans”. Within the “Democratic” camp the centre was the main beneficiary of these mobility patterns, also largely drawing votes from the centre-left. Future elections in Israel will continue to reflect the demographic patterns just outlined as long as the voting method remains unchanged. If so, current trends foreshadow a rather conservative outlook for Israel’s party system. On the other hand, division of the country into electoral districts and a higher admission threshold would promptly cause a sharp reduction in the number of parties, probably along the typology illustrated here. But it should not be forgotten that the main gist of political voting is not demography or social structure: it is politics. Choices and behaviours, careful or mistaken, by political leaders will determine the destiny of Israeli society facing its complex challenges, and will be reflected in future election results.